Excellent tour of Le Marais. Outstanding tour guide makes all the difference. Lots and lots of walking , so wear comfortable shoes. Our guide, Gil, took us to all top notch stores for samples of pastries, candy, cheese and we ended at a bistro for snacks and wine. Wonderful walk thru the Maria’s district..weak link was the wine and cheese..but even that was very good...it’s just that the rest was sooooooo very good, excellent! Really like this tour and the tour guide. They were knowledgeable and informative and we met a lot of interest people on the tour. This tour was amazing! I really felt the local touch, our guide has been amazing in making us feel like true Parisian and by the end of the experience we were all very happy about the things learnt during this activity. He shared with us a lot of information and brought us to see the best food treats spots in the Marais. I cannot recommend this tour enough, thank you! This was an excellent tour. The guide was excellent, fun, and really kind. 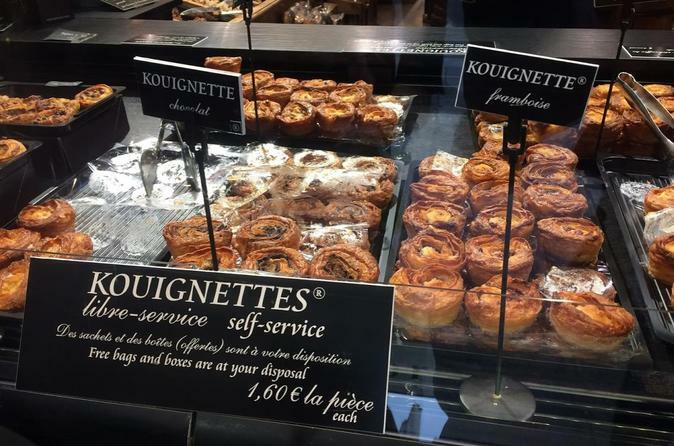 We were able to taste a number of delicious pastries and find some really cool shops. Afterwards we had a lovely and relaxing wine tasting. I love desserts, but sitting around with the group having wine was the perfect ending to the tour. The hosts were very kind and offered us wine and a nice meat and cheese trays. Would do this again! Our guide, Arthur, was so fun and interacted with everyone really well. He guided us around the narrow streets, stopping for all of the planned treats and a few extras if someone wanted to make a purchase. I don't know if the other tours include aux Merveilleux and Pierre Herme, but they are worth choosing this tour over any other similar one. The pastries and macarons are amazing, but the history and tour of the Marais are just as enjoyable. We ended in a little cheese and wine shop that looked like they made the shop by roofing over a small gap between buildings. The wine was excellent and generous, as you'd expect in Paris! This tour was amazing! I'm so glad that we decided that this was the way to find out of the way places that we wouldn't have found on our own. 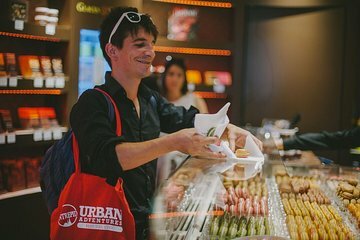 Not only did we sample out of this world pastries, try different cheeses and sample wines, but our wine shop owner gave us a great overview of where the wines came from and why certain grapes were grown in certain regions! The small group lets everyone bond and we became great friends by the end of the tour. Our guide pointed out so many architectural features and historic insights along the way that we learned as we ate. The food was fabulous! We would do this again. This was amazing, possibly the best tour my and my wife have done in visiting Europe for 3 years and doing over 20 different tours.. highly recommend!